Return to main article: "Peer-to-Peer Cooperative Positioning"
Japan’s and India’s regional and augmentation satellite navigation programs look forward to an active year, according to speakers at March’s Satellite Navigation Summit in Germany. 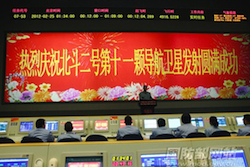 Compass/BeiDou-2, China’s GNSS program will launch 5 satellites this year to join the 11 already in orbit, according to Li Xing, a representative of the China Satellite Navigation Office. This will support a planned declaration of initial operational capability (IOC) for a regional system covering 84˚E to 160˚E and 55˚S to 55˚N, he said at the Munich Satellite Navigation Summit in March. The rapid development of the Chinese system was refelcted in the allocation of its own session during this year’s Summit, the most important GNSS policy gathering in Europe. 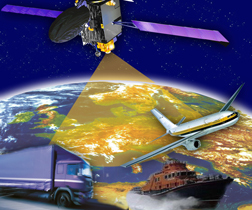 The European GNSS program expects to gain an additional €7 billion (US$9.1 billion) budget for 2014–2020 to support Galileo and the European Geostationary Navigation Overlay Service (EGNOS), a satellite-based augmentation system that currently provides differential corrections to GPS signals, according to Paul Flament, Galileo and EGNOS program manager for the European Commission. He spoke at the 2012 Munich Satellite Navigation Summit that ended on March 15. GLONASS completed its long trek back to full operational capability with 24 operational satellites in the constellation last December, but Russia intends to keep pushing ahead with its GNSS, said Roscosmos official Sergey Revnivykh at the Munich Satellite Navigation Summit in March. GLONASS now has a 347 billion ruble (US$11.81 billion) budget approved through 2020, by which time the system is scheduled to have 24 satellites transmitting both the new CDMA and legacy FDMA signals. 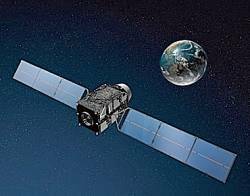 Return to main article: "GNSS Jamming in the Name of Privacy"